CTA | Carrying Tender Angels, Inc.
"Our arms may be empty, but our hearts are incredibly full!" We have rolled out the red carpet and officially marked Friday, September 9, 2011 as the grand opening for our website! This has been a long journey worth every moment. We hope that you take a few moments to join us at http://www.carryingtenderangels.org to see how all of our hard work is finally coming together. Please note that the month of October is recognized as Pregnancy and Infant Loss Awareness month. However, we need remember that every day in the United States 80-100 babies are stillborn, and nearly 100 more infants die before his or her first birthday. These families need our help, not only in October, but throughout the year. Check out our website to learn more about how you can help, too! It’s Official! We are Now a 501(c)(3) Non-Profit Organization! After coming home from the hospital I opened the mailbox only to find there was a letter from the IRS. We had submitted our application for 501(c)(3) in late April, and considering this was only early June, I had presumed that the letter was a denial. We were told that we would not receive a determination letter for up to 100 days after the IRS received our application. Since we had submitted our application just after the April 15th cut-off date for taxes, we presumed we would not hear back from the IRS until late in the summer. As I opened the letter I dreaded what I was about to read only to be wonderfully surprised as my eyes skimmed over that first sentence, “We are pleased to inform you….” Tears instantly flowed as all of my emotions came flooding out, literally! All of the hard work had paid off, and this approval letter couldn’t have come at a better time! I know deep in my heart that this timing wasn’t just ironic, but rather a wonderful gift from my awesome son! Now we can really push forward with CTA and begin the process of expanding to other hospitals!! This past month has been quite a roller coaster with all of the ups, downs, twists and turns. We have about 50 bears all tagged and ready to go. We were working out the details to make our first delivery of bears to the hospital when we were told that someone we knew had just found out at their 34 week appointment that their baby no longer had a heartbeat. This was so devastating. We knew in our hearts with the prevalence of stillbirth and infant loss that one day we would directly know someone going through this horrible loss…we just never knew it would be just 8 and a half short months after we lost Collin. Although we never want any parent to have to lose a child, we know that it’ll continue to happen and at such alarming rates (one in every 115-200 births) that this alone continues to drive us forward through this whole process so that CTA can be there to support these families. We were fortunate enough to be able to talk with the parents and families and best prepare them for what they were about to face. We were able to tell them things that most others wouldn’t understand or think about because we had already been through it all. Once the baby was born we visited with the family at the hospital and took one of our bears. What a bittersweet moment to know that we were having to delivery a bear to someone we knew, yet know at the same time that by doing so we were helping them through this difficult time. Looking back on it it was such a special moment. It’s not the kind of moment you want to have happen, but the kind that you will cherish forever. Most often we will never have any contact with these parents and families. Most to all of our contact will be with the hospitals and Labor & Delivery staff. We will always remember this moment, and hope that we were able to help them in so many ways more than just simply filling their empty arms. This has now sparked a new thought and direction for CTA that goes beyond the Teddy bears. We hope that our organization continues to grow and give us the opportunities to do so much more. Ironically, a week after we delivered our first bear, Mindy, a dear friend who is also on our Board of Directors, had a high school friend who lost her baby as well. She was able to deliver a bear to her and Mindy has expressed how wonderful it was to witness firsthand the meaning behind CTA and how helpful it can be to families as the begin to heal. So, we have made two personal deliveries this past month…something we could never have expected. Our drive to get CTA really up and running soon has been accelerated. If only there were more hours in the day! We knew that a lot went into developing a non-profit organization, or so we thought. Little did we truly know everything that went into it until after we decided that this was our calling. Even though we have Collin’s memorial fund to help us get started, there wasn’t enough to be able to pay a non-profit attorney or someone else to do all the paperwork for us. Since mid December of 2010, CTA has been our second job, but I use the word job cautiously. This isn’t our job but rather our passion. I work a day job to pay the bills, but I feel most alive when I’m working on CTA. This may be hard for some people to understand, but since I no longer have Collin here on earth, I don’t have a child to nurture. I have all of these motherly instincts, feelings, and emotions, yet no child to raise. CTA is my way of being able to take care of my son by helping other parents of angels when they need it most. I believe deep within my heart that Collin is so proud of his mommy and daddy for helping these families. It is very healing for us to know that we are making a difference. Our time dedicated to CTA, even if to be able to help just one family, is worth every moment! There are so many documents to fill out and file at both the state a federal levels. First you have to become incorporated and recognized as such by your state. Then you have to write articles and bylaws and file those. Next is your Employer Tax ID even if you will not be hiring any paid employees after which you can file for tax exemption status, or 501(c)(3). That is the monster document of them all! The application alone is 30 pages, but anytime you answer yes in the application you must give an explanation on another sheet of paper. Our entire application was over 50 pages long! Finally, upon approval you then have to file more documents with the state before you are able to solicit any funds. Whew…I told you it was lengthy! For me this feels like it’s been a slow process. To think we started over 6 months ago is almost crazy. I know we’ve accomplished so much, but not knowing what we were getting ourselves into I thought we’d be much further along at this point. However, I just have to keep reminding myself that we are making progress, even if only one day at a time. It’s Been an Incredible Journey! The past nine months have been an incredible journey–both devastating and joyful–but incredible, nonetheless. One year ago I was 6 months pregnant and exactly 3 months away from becoming a mother. My husband and I had been married for 6 years and were anxiously waiting for the arrival of our first-born child. Unfortunately, the day after my 39th week check-up we learned that our baby’s heartbeat had become silent. The most beautiful boy, Collin Timothy Althoff, was born on September 26, 2010. He was so precious with his full head of dark hair, chubby cheeks, and long, skinny legs. We spent as much time with Collin as we could over the next 24 hours knowing these would be our only moments together on this earth. Before we left the hospital, a family friend, Patty, had given us a teddy bear to carry in our arms home. This was to help ease some of the deep pain we were feeling from the tragic loss of our son. This teddy bear, which we had named “Collin Bear,” helped us so much throughout the days, weeks, and months which lie ahead. Collin Bear was constantly in our arms or by our side as we travelled around making all of the arrangements for Collin’s funeral. Although Collin Bear could never even begin to replace Collin, having something physical to hold, comfort and “take care of” helped alleviate some of the deep emptiness and pain we felt without Collin. Some of our friends, Brian and Lynn, had started a memorial fund for Collin. We prayed for direction on what we should do with the fund to best serve others in honor of our son. A couple of months later we had our answer…Collin Bear! This seemingly simple bear had been such a blessing to us, and we felt that teddy bears could also help future parents when faced with the death of their baby. 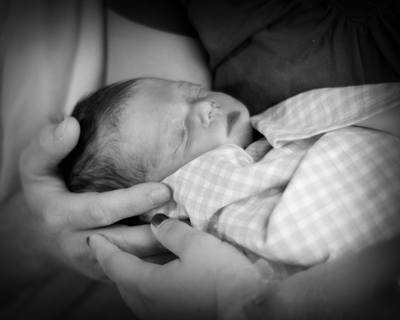 It quickly became our mission to make sure that no other parent had to leave the hospital with empty arms. Because we were honoring our son in our new life mission, we wanted to name the non-profit organization after him. Instead of using his name, we decided to use his initials, CTA, and from that idea grew our name, Carrying Tender Angels. Carrying Tender Angels (CTA) perfectly describes the true meaning behind our organization. Expectant mothers carry their tender angels throughout their pregnancy and anxiously wait for the day when they will be able to carry their tender angel home. For some families all of their hopes and dreams become instantly shattered when they learn their baby has died. Although these parents will not have the chance to carry their baby home, they will forever carry their baby deep within their hearts. It is at this moment that CTA offers parents a beautiful teddy bear to carry home. However, CTA doesn’t stop there…in fact, this is just the beginning of how our non-profit organization offers assistance to parents, families, and friends affected by the tragic loss of a beautiful baby. Now, you’d think that helping others in such a way would not be too difficult…were we wrong! We never could have even imagined all that went into building a non-profit organization, but it has been well worth all of the time and effort, even if to help just one family. We are so fortunate to have had all of the wonderful love and support from all of our family and friends throughout this journey–we couldn’t have done it without you!